NUJO's first jam session of the new academic year and the place was crammed. 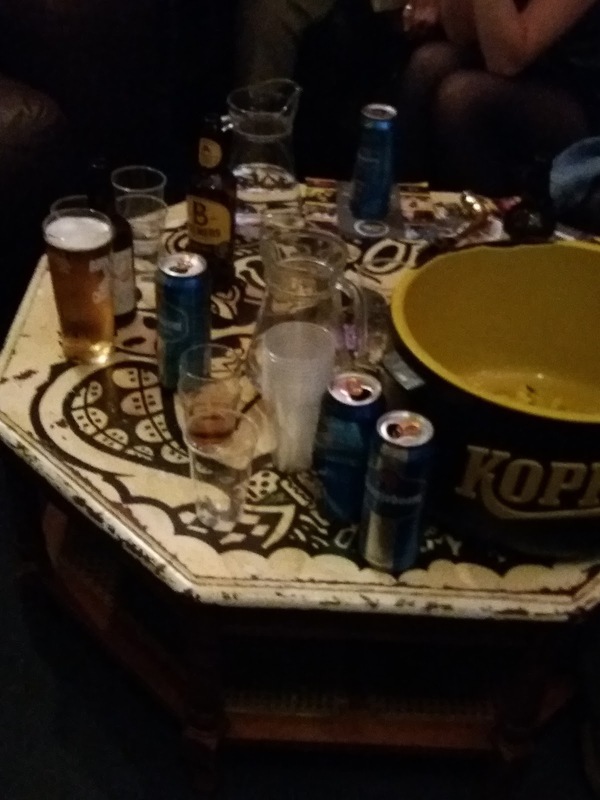 A battalion of bright young things drinking like there was no tomorrow, sorry, studying hard (see photo of a study desk inexplicably littered with empties), this was a 'social' as much as a jazz gig. President Tom McDonald has knocked the NUJO boys and girls into some kind of shape so that they broadly resemble a big band. 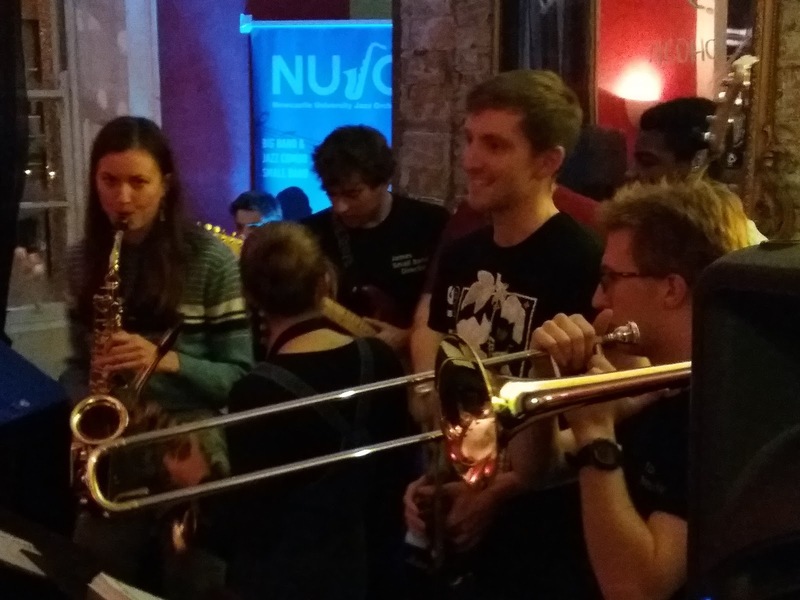 Enthusiasm by the bucket load, trombonist Tom and bandmate Matt Green whipped up Bar Loco's partying crowd and counted in the ever-changing band line-up. Lullaby of Birdland, former Jamboner Kate Garnett bold as a shiny brass trombone on My Funny Valentine, a debuting vocalist emboldened by a bottle of house white singing Billy Taylor's I Wish I Knew, NUJO blew for fun in a fun, party atmosphere. Jam session man about town, guitarist James Cuxson, impressed once again, making himself heard above the din of the party-going audience on Blue Monk and again on So What having been joined by bassist Ifede Osiyemi, last spotted gigging with the Bold Big Band. Osiyemi hit a groove - most impressive. An impressive two-trombone opening to Autumn Leaves won applause from the multitasking crowd (drinking/laughing/chattering/listening...most impressive!) and before long alto saxophonist Matt suggested a short interval. Second set...what a surprise, Matt Green, alto sax, sang! Fly Me to the Moon sang Matt, perhaps as good a vocalist as an alto player! Chameleon went round and round, a seriously funky Superstition featured just about everybody including a rather good, no- time-to-take-off-his-coat clarinetist, which morphed into an Uptown Funk groove. The 2018-19 NUJO line-up is looking good (trumpeter Tom Alcorn, heard at the Dun Cow, is one to watch). The band will be entered into next year's Great North Big Band Jazz Festival (it always is) and will be sure to give a good account of itself, if not make the podium. 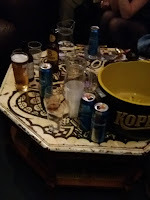 Further jam sessions will occur during the year, do get along to check on the undergraduates' progress. Jam Session @ the Black Swan - October 30. Tonight at the Black Swan - 8 pm. CD Review: Evelyn Laurie - A Little Bit of Me. CD Review: Mike Bogle Trio - Dr. B! Jam Session at the Dun Cow, Jesmond - October 24. CD Review: Lionel Loueke - The Journey. CD Review: Sara Colman - What We're Made of. APPJAG - Tonight's the Night! Preview: From Vermont to Cullercoats!